As its name implies, the bullfrog (Rana catesbeiana) is large, and in fact so large that it's North America's biggest frog. Its skin is typically shades between light and dark olive green, with a light belly. It's fairly simple to distinguish between male and female bullfrogs, if you know what characteristics to observe. 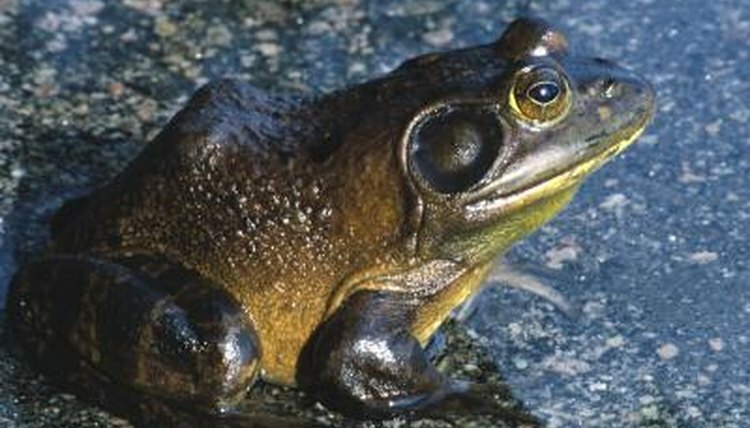 Female bullfrogs are larger in size than males are, and males' heads are more narrow. The female's throat is white, whereas the male's throat is yellow. A bullfrog's round eardrums, called tympanums, are on the outside of his body, behind his eyes. The male's eardrums are larger than the female's and bigger than his eyes. In contrast, the female's eardrums are about the same size or smaller than her eyes. You can distinguish between male and female bullfrogs when they're mating. The male crawls on top of the female, then he grips her torso while she lays eggs. His thumbs swell during breeding to improve his grip. Although smaller in size than females, male bullfrogs make their presence known by emitting loud calls, which females don't do. A male mostly makes these sounds during the breeding time of the year at night to attract females as mates.